In Home Warranty is an established company based in New Jersey and owned by Choice Home Warranty. Since 2008 they have been providing quality service to their warranty holders nationwide, through their 24/7 customer service center. First month of warranty coverage is free. Add-on options for additional systems and appliances. 13 months available for the price of 12. A specific customer service representative will handle your claim. Contractor appointments within two days. Local contractors for speedy service. Only the most basic of information available before a quote request. Limited customer reviews available online. In Home Warranty offers two plans. The ‘Total’ plan covers the electrical, heating and air conditioning systems, the water heater, plumbing system, plumbing stoppages, dishwasher, refrigerator, oven/stove, washing machine, clothes dryer, ceiling and exhaust fans, garage opener, garbage disposal, and ductwork. The second plan is the ‘Basic’, which covers most of the same systems and appliances as ‘Total’ but excludes air conditioning system, refrigerator, washing machine and dryer. They also offer optional coverage for items such a pools, spas and sump pumps. Terms and conditions for In Home Warranty are very similar to the average home warranty company, there are no strange exclusions or unusual requirements. Service fees are $60 per call out and coverage begins 30 days after they receive your premium. Customer service representatives are available to take your call 24 hours a day, 7 days a week. In Home Warranty strives to have a contractor to you within two days for claims submitted during business hours and four days for claims submitted during a weekend or public holiday. When you call to submit a claim, you are assigned a dedicated customer service representative. They are your single point of contact and will be responsible for your claim from beginning to end. In Home Warranty subcontracts their service calls to a select team of qualified service technicians based in the communities they serve. Not a lot of information is available from In Home Warranty until you submit a request for a quote. When that information is provided it is easy to understand and offers no surprises with regard to coverage or terms of service. 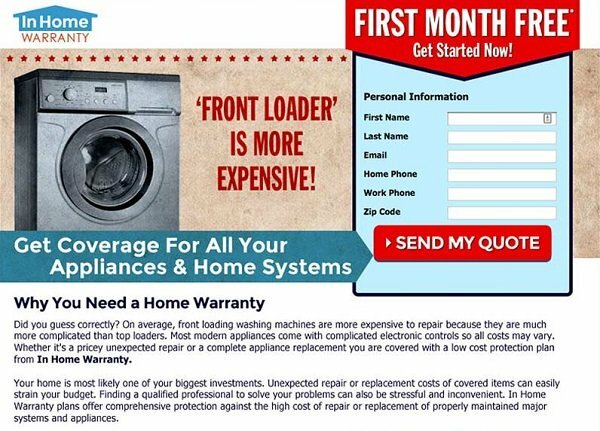 A small home warranty company that could do more to offer information.